Decision 2014: What’s the Snap really like? Set changes: When you’re working with the Snap, you’re working with pre-filled 300 unit insulin cartridges. The infusion set is self-priming too. You don’t have to worry about reservoir fill-ups or air bubbles, and that means you wind up wasting a lot less insulin just hooking yourself up again. Definitely a plus. As a result, you’ll probably spend more time on each cartridge. For that, Asante plans for you to use one specific set (with the primer(?) connector) for your changes including insulin. Then they want you to use a different set (without the connector) after 72 hours if your cartridge isn’t running out of life juice. I’m not sure how all that works, because personally, I’m not about to do a set change after three days, then another one 48 hours later. I just kept the first set in for the normal 5 days (5 ½?) it takes me to go through 300 units. And unless I’m dealing with some serious heat, that doesn’t seem to be too much of a problem. I will add, also, that the simple time savings of having a pre-filled cartridge isn’t that big a deal for me, though it is nice. Humalog Only Accepted Here: Also, let’s not forget that the cartridges come in Humalog only. I’ve been primarily a Novolog user up to now. This is only my experience, so take it with a grain of salt: In my 2-plus weeks on the Snap, I’ve found that Humalog brings me down from spikey highs, but it does so in a very slow, stairstep kind of way compared to Novolog. As a result, I’m learning to avoid things like potato chips and pizza. I am getting better at managing my diabetes with Humalog, so this isn’t necessarily a deal breaker. Though that’s a good thing, it’s crazy to think I’ll never eat those foods again. If I had a choice between the two, I’d stick with Novolog for now. Striker! You’re coming in too low! (Bonus points if you know which movie that’s from) One of the issues I found (that I don’t remember being covered in training, but I may have missed it) is that when your BG comes in under 70 mg/dL at the moment you’re sitting down for a meal, you can’t use the smart bolus feature. This happened a couple of times during my trial. My pre-meal check came in at 64 or 60, and I couldn’t enter those numbers using the smart bolus feature. To get around this, I wound up entering my BG number for the smart bolus at 70, then dialing down the insulin amount slightly to get to where I think I would be okay, as long as I ate right away. Also: When you do treat before eating, you do have the ability to enter in the carbs you already had (First Carbs), then the carbs you’re about to eat on a separate screen. It will figure out your bolus accordingly. 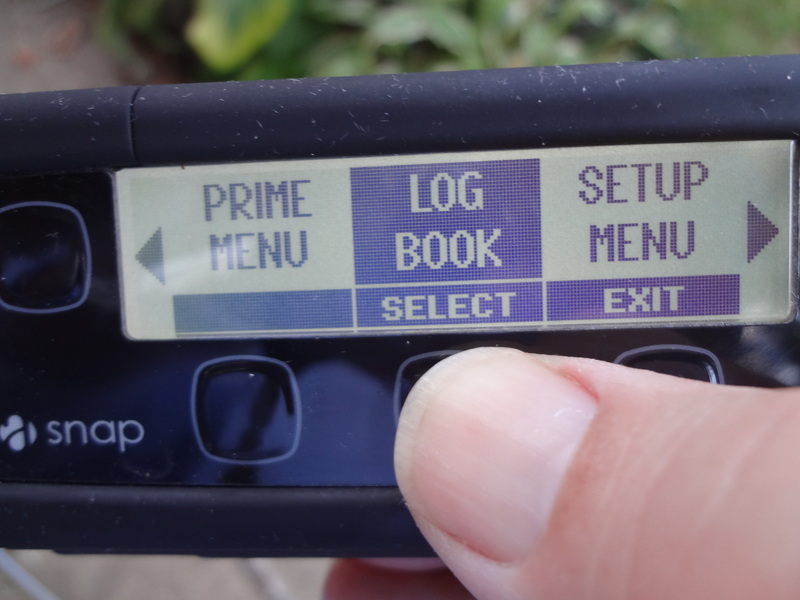 As a (somewhat) veteran insulin pumper, this feature drives me crazy. But if I was new to pumping, or a CDE or doctor working with someone new to pumping, I might find this a great safety feature. Again, this isn’t a deal breaker or a deal maker for me. It’s just a quirk of using the Snap, and I thought you should know about it. I should also mention that the Snap will deliver boluses three different ways: The Now Bolus, Timed Bolus, and Combo Bolus. The Now Bolus is delivered right away. The Timed Bolus delivers your bolus at a specific amount of time (minimum 30 minutes). 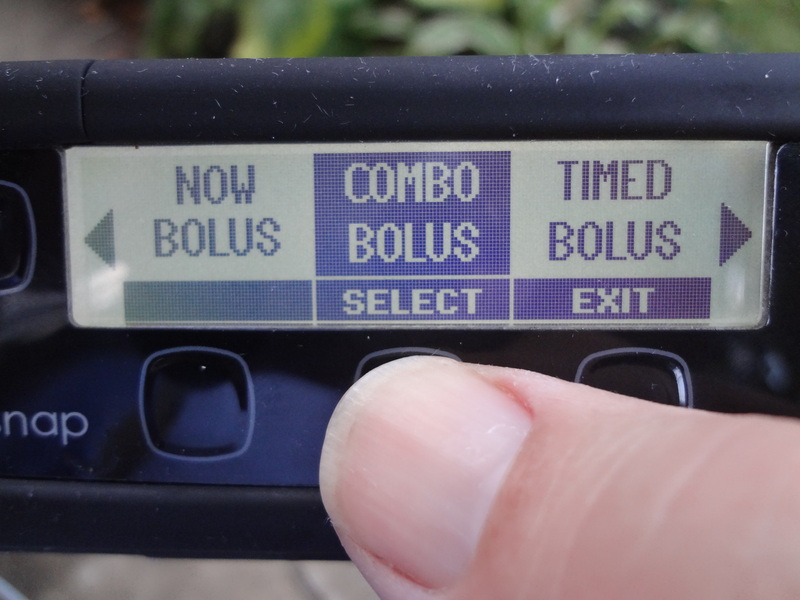 And the Combo Bolus is pretty much like the Dual Wave bolus on the Medtronic pumps… delivering a set amount now, and a set amount later, predetermined by the user (in 15 minute increments, which I like). Beep volume: Love, love love the beep volume on this thing. I also love that it’s adjustable. This is such a simple feature. Why can’t other pumps incorporate this idea? Additional features: The pump has a flashlight feature on it. That’s nice if you need a light and can’t find one anywhere else. Otherwise, turn the light on. If you’re low, your significant other will forgive you. Sorry… I don’t mean to make light of this feature… it shows that the manufacturer has added something that most People With Diabetes will find helpful. 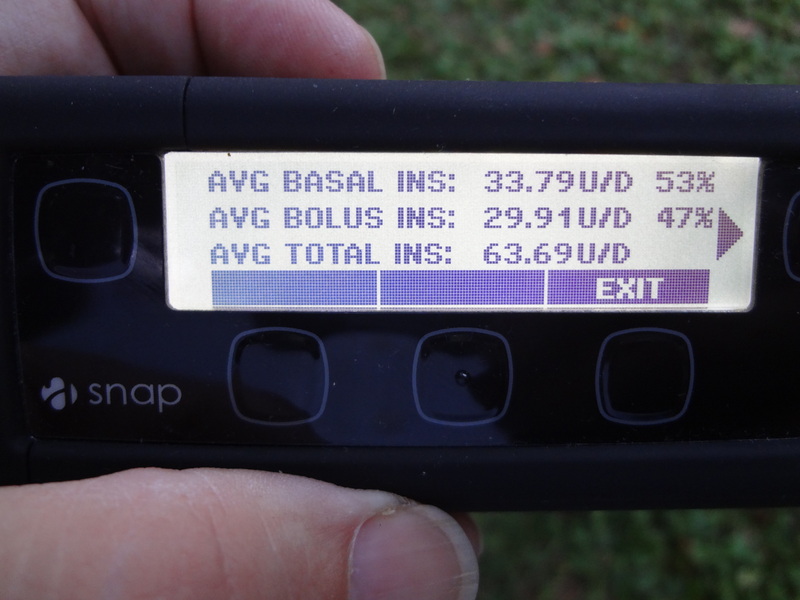 The Snap also has the ability to create more than one basal profile. Again, I think all pumps should have this feature. When I do a long bike ride, I want to be able to change my basal profile for the entire day, not just perform a temp basal then forget about it once it’s complete. Bolus delivery is pretty fast. Not sure how big a deal that may be for you (it is not a big deal to me), but I thought I would mention it. On the scale of bolus delivery speed, I’d put the Animas Ping at the top, then the Snap, then Medtronic, and t:slim far behind. Finding your daily totals and how they translate into 5 day, 10, day, or 14 day averages (14 days is the highest setting) via the Log Book menu item is pretty easy. This is another feature that I don’t remember covering, but it was easy for me to find. Again, I think new pumpers (and their medical teams) may find this helpful. Ease of use: The Snap is actually a pretty easy pump to use. Not a lot of clicks to get around to what you need. Menu descriptions make sense. If you like the pre-filled cartridge idea, and the self-priming, that’s an added bonus. I could imagine myself using this pump on a daily basis. Here’s where I will also tell you that the local pump rep has been fantastic, answering questions and calling me a few days after I began to see if I had any follow-up questions or issues. In a few days, I’ll be sending the pump back to Asante. Not because I’m not satisfied. 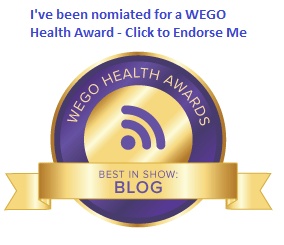 Rather, because I want a little time to do some additional research and decide what is best for me from both a patient and an economic perspective. I hope you’ve found this recap helpful. And if there’s anything else you’d like to know, be sure to ask. 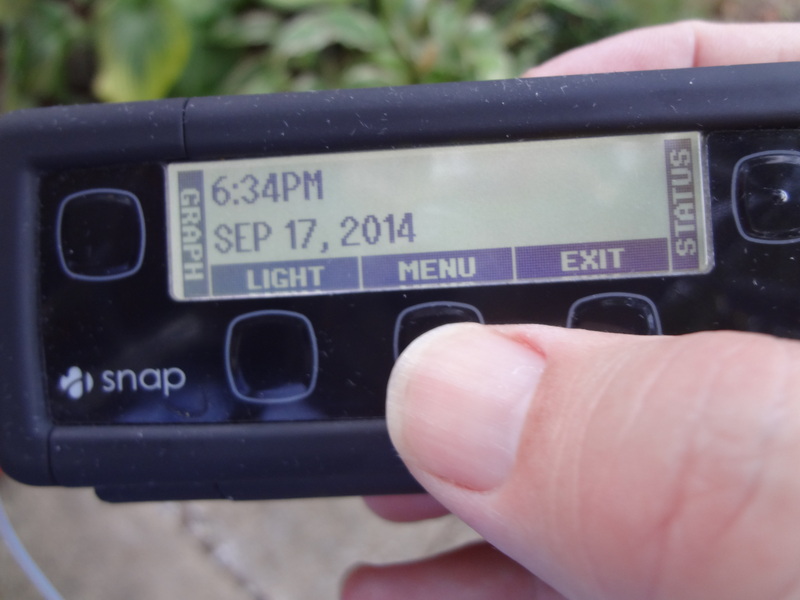 Disclosure: I’ve been on a standard four week trial of the Asante Snap insulin pump. This is the same trial that is available to all users who are considering starting on insulin pump therapy, or are considering a pump change. I was not given anything by Asante, and I was not asked to write about my experiences. In fact, I did not tell them I’m a writer at all. All opinions, as always, are my own. « Hey! You look just like me! Nice review. I have the same reaction to Humalog that you do and prefer Novolog as well. I was really interested until you mentioned the Humilog. I’ve been on Humilog for years and this year my insurance company decided not to cover it; they made me switch to Novalog. Personally, I don’t notice a difference. But if the SNAP only uses Humilog, I’m out. Great summary Stephen, not just of the Snap, but of Humalog vs Novolog (I’ve been on Novo for about 10 years and forgot how the other works for me). Of all the pumps on the market (other than the one I wear), this intrigues me the most – simply because of its simplicity. I can see how the timed bolus (which is more of a delay than a square-wave, right?) can be helpful if my meter rings up a low number at mealtime, and the reading about the 15-minute intervals on the Combo bolus is making me miss something I never had in the first place. One thing though… don’t all modern pumps have basal profiles, or am I missing something? Awesome review! Thanks so much for sharing!! I love any post with a good Airplane quite! !